Extrusion can be defined as the act or process of pushing and shaping a material by forcing it through a die. Food extrusion is a process in which food ingredients are forced to flow, under one or several conditions of mixing, heating and shear, through a die that forms and/or puff-dries the ingredients. Extrusion technology has been widely used in various forms and in several applications for many years. New equipment designs have increased the range of extrusion applications in food processing, allowing to produce a broader selection of foods according to consumers’ taste, and extrusion processing has become a standard operation in many food industries. Extruders can be also described as devices that can transform a variety of raw ingredients into intermediate and finished products. In some cases, the final extruded product can be also cooked, and the process is then defined as extrusion cooking. The cooking temperature can be as high as 180–190ºC during extrusion, but residence time is usually only 20–40 seconds. For this reason, the extrusion cooking process can be considered a high temperature-short time (HTST) process. * RIAZ, M. N. (2000) Extruders in Food Applications. Technomic Publishing Co., Lancaster, Pennsylvania. easy scale-up from pilot plant to commercial production due to a consolidated knowledge. Single-screw extruders provide a relatively poor mixing , and for this reason they are usually supplied with a separate mixer where material can be premixed and preconditioned with added steam and water. Preconditioning enhances extrusion processes, controlling the correct moisture content and providing a longer equilibration time so that product quality can be improved. Moreover, preconditioning of the raw materialextends the life of wearing components in the extruder by several fold. Although the weight of ingredients in the extrusion system is increased, preconditioners are relatively inexpensive to build for the volume they hold and time added to the process. The single-screw extruder barrel assembly is composed of a stationary barrel housing a rotating extruder shaft carrying screws and shearlocks, a jacketed head, a die, and the product cut-off final knife. 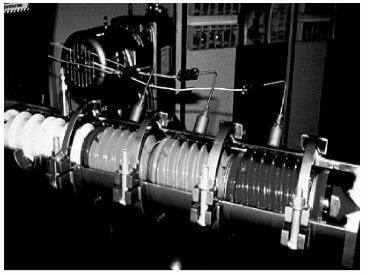 Another configuration is represented by a uniform diameter barrel with the final segment tapered or decreasing in diameter. 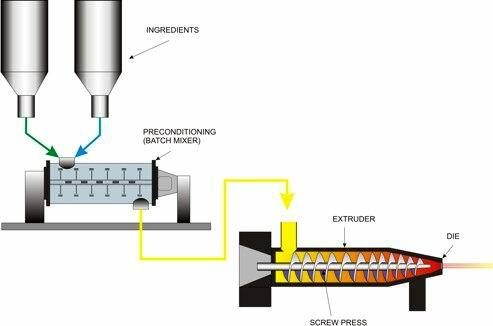 The screws are the key element of the single-screw extruder and performance of the extruder is strongly influenced by their geometry. When no external source of heat or steam for injection or jacket heating is required, we can use the term ‘dry’ extrusion, and all product heating is accomplished by mechanical friction. If the ingredients have sufficiently low initial moisture content, drying of the product after extrusion cooking may not be necessary. Moisture loss in dry extrusion can be obtained in the form of steam flash-off at the die exit, and the extent depends on initial moisture in the ingredients and product exit temperature. Water can be provided in dry extruders with injections during extrusion, for example in extruding starchy material requiring some moisture in order to gelatinize. Dry extruders are usually single-screw extruders with screw segments and steamlocks (choke plates) on the shaft to increase shear and produce heat. These restrictions are arranged in such a way that they increase in diameter toward the die end of the screw to create more pressure and shear as the product reaches the die. The combined pressure and temperature effects, together with the shear stresses developed, plasticizes the raw materials into viscous paste or puffed shapes, depending on the raw material. The only difference between “dry” and the ‘wet’ extruders is that more shear occurrs in the former. In dry extrusion, pressure and temperature are at their maximum just before leaving the die. The die design and opening also play very important roles in pressure build-up. The cooking range in a dry extruder can be 82–160ºC with very high pressure. As soon as the material exits the extruder dies, pressure is instantaneously released from the products, causing the internal moisture to vaporize into steam and making the product expand and resulting in a sterilization of the product. Extrusion can be used prior to screw pressing to increase throughput of the expeller over the rated capacity. Oil and meal produced by this method are more stable because extrusion also releases natural antioxidants in oilseeds. This process is used for processing raw soybeans into full fat soybeans and partially defatted soybean meal. On the other hand, sensory characteristics can be modified by high temperature oilseeds energic breaking, like in olive extra-virgin olive oil. • recycling wet waste from food, and animal by-products. Technological advancements like the introduction of variable speed drives, the possibility to control digitally the process and an improved gravimetric feed system and mass flow meters for precise metering of ingredients/recipe components are among the most important innovations. Twin-screw extruders are more complicated than single screw extruders, but they provide much more flexibility and better control. In the counter-rotating position the extruder screw rotates in the opposite direction, whereas in the co-rotating position the screw rotates in the same direction. premium pet food (with fresh meat). Friction represents an important factor in extrusion process: for this reason single-screw extruders are limited to 12–17% fat level in the formula because fat above that level reduces friction increasing lubrication and decreasing mechanical energy transformation into heat. Fat levels can be increased up to 18–22% in twin screw extruders still maintaining the mechanical-thermal energy transformation. Moisture content is a critical parameter in the extrusion process for starch gelatinization and protein denaturation: average moisture content in a typical formula ranges from 20–28%. Twin-screw extruders have the ability to work under wider ranges of moisture. Moisture, as steam and/or water, is sometimes added to the preconditioner and extruder barrel to help soften raw ingredients and reduce their abrasiveness.